Hot deals for downsizers | What Car? Less is the new more when it comes to buying a smaller car. Less bulk to squeeze into a parking space, but often more room inside than you'd expect. Less thirst for fuel, so there's more money left in your pocket. We've got a selection of fantastic deals on small cars, so you can spend less time haggling a deal and more time enjoying your new car bargain. All are available until February 11. If you're after something different, visit our New Cars For Sale page to search all our great deals, whatever size car you're after. Downsizing doesn't have to mean signing up for a supermini. 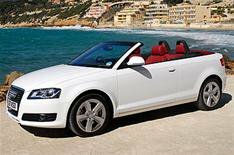 The convertible A3 is stylish, desirable and great to drive. Best of all, the roof folds away in moments. Drivethedeal.com is offering 2563 off the 2.0-litre diesel S line model, which is now 24,137. A smooth engine, responsive steering and agile handling make this an enjoyable car to drive. It's well equipped, too, although not the classiest coupe around. Find the BMW 125i Coupe SE with a 2922 discount at Coast2coastcars.co.uk, where it's 21,113. Bags of style and a comfortable ride make the Citroen C3 a tempting choice for downsizers. There are some compromises required, though: rear space is tight and this model doesn't get stability control. Dealdrivers.co.uk is offering 1188 off the 1.4-litre HDi 70 VTR Plus five-door model, which is now 12,602. Funky looks and a fun drive make the Fiat Panda an appealing small car that's cheap to buy and run. Rear legroom isnt brilliant, but the 1.3-litre diesel engine is super economical. Fiatsupasaver.com is offering 1705 off the Fiat Panda 1.3 MultiJet Dynamic, which is now 8295. Finding a parking space for Ford's smallest model should be easy; finding space for yourself and a passenger is easy, too. On the downside, the spec could be more generous and buyers get only two airbags. For a 1281 discount on the Ford Ka, visit Dealdrivers.co.uk, which is selling the 1.2-litre Style Plus model for 8879. For a small car with a huge list of goodies, this Renault Clio fits the bill: it has air-con, electric front windows, alloy wheels and a TomTom sat-nav. The 1.2-litre engine could struggle if you don't travel light, however. Visit Uknewcars.co.uk for a 3110 discount on the Renault Clio 1.2 (75) Dynamique TomTom five-door model, which is now 10,096. The Seat Ibiza is big on style, combining sporty looks with low running costs. The 1.6-litre diesel model is fabulously frugal with low emissions, yet is still decent to drive. Dealdrivers.co.uk is offering the 1.6-litre TDI CR Sport model for 12,375, a discount of 1365 on the list price. Toyota's Yaris supermini is another car that's small on the outside, but big on the inside. Good fuel economy makes it cheap to run, although list pries are higher than we'd like. However, with 1840 off at Drivethedeal.com, the five-door 1.4-litre diesel model looks more reasonably priced at 11,726. Vauxhall's Corsa is already a great-value small car: fun to drive, top quality and, in 1.2-litre form, cheap to run. Find a 2012 saving on the 1.2-litre Exclusiv three-door model with air-conditioning at Dealdrivers.co.uk, where it's on sale for 10,528. For something very like a VW Golf but a little bit smaller, try a Polo: it's almost as spacious and just as desirable. Uknewcars.co.uk is offering 1112 off the five-door 84bhp 1.4-litre model in SE trim. That means our 2010 Supermini of the Year can be yours for just 11,918. The C30 is already a classy-looking car, and the R-Design package adds an athletic bodykit and sharper handling. With the punchy 2.0-litre diesel engine, this is an entertaining small hatch to drive. Coast2coastcars.co.uk is discounting the C30 by 2219, making it 17,576.